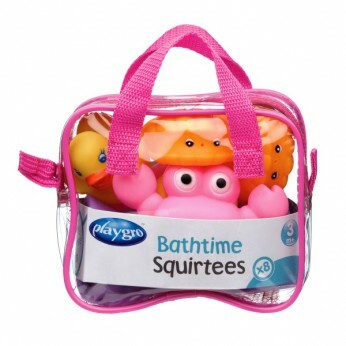 Playgro’s soft, squeeze bath squirties which can fill with water for fun water play. Each set contains 8 fun colourful animals for hours of bath time fun. Packed in a handy gift bag which can be used to neatly store the squirties. Features: Eight soft, easy to hold shapes. Squirts water for bathtime fun! Handy storage case. Available in neutral colour option also . This toy costs approximately £6.99 (for the latest and best prices make sure you check our retailer list for the Playgro Bath Time Squirties 8pcs Pink above). In our review of Playgro Bath Time Squirties 8pcs Pink we classed it as being suitable for ages 0 to 11 months but recommend you check the manufacturer specific advice before purchasing.